The Container Ship is vital for life in the modern society, The operator's responsibility for safety, It provides efficient transportation worldwide. through quality at all levels is crucial, and proper maintenance on board the vessel is a key factor. The Integrated Survey Program (ISP) is one such tool used in this respect, particularly dedicated to Container Ships. This is an arrangement by which the class work is carried out in a more streamlined and professional way by utilising the ship's own personnel. The value of the inspections carried out by the ship's personnel relies heavily on their knowledge in the field. They must be trained to observe and locate weakness in the ships hull structure during and as a part of the normal operation. The course provides the knowledge required for carring out a good and effective inspection of ship's structural members. Structural arrangement and hull integrity with respect to types of Container Ship design and for maintenance and operation of them. 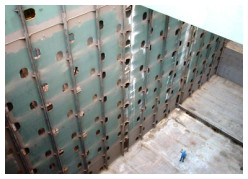 Focus on the critical structural areas and common hull-related problems found on container ships. Arrangement for stowing and securing of containers on board. Survey of hull structures of Containers Ships carried out by classification societies. Perform owner's own inspection of the hull with respect to structures and cargo containment arrangement in the PIMS. Be concerned for the safety of the ship. Be concerned for personal safety.